As a business owner, you will no doubt appreciate that any interruption of your electricity supply could cause significant problems. Finding a good commercial electrician in London is therefore important. The money spent employing a competent and well qualified tradesman pays dividends in the long run. You need someone who can deliver excellent results and not simply carry out a quick fix – any signs of wear in a commercial electrical installation can escalate rapidly. Your business has a legal duty to ensure that the electrical installation on your premises is safe, not only under normal operating conditions but also if there is a fault (Electricity at Work Regulations). Regulation 4(2) states that “All systems to be maintained so as to prevent, so far as is reasonably practicable, danger”. “System” means the wiring of an electrical installation and everything connected to it i.e. any portable appliances used by your staff also need regular testing as well as the circuits, sockets, switches etc. So in other words, if there is an incident involving personal injury or death on your premises, you need to be covered. You need to prove that you have not been negligent. Test reports and other preventative maintenance documentation forms the basis of this proof and will provide your best defence against prosecution should the need arise. The frequency of testing as recommended in the 17th edition of BS7671 depends on the nature of your business, for example, in an industrial setting, a yearly inspection is the ideal but no more than 3 years should elapse between the tests. For other types of business, different timings are defined – for example with leisure centres a 4 month inspection is the recommendation. A properly qualified commercial electrician in London will be able to advise you for your particular situation and be able to carry out the testing and provide the required reports for your files. 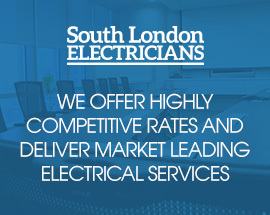 We have many years of experience as commercial electricians in South London and have worked on a wide variety of different installations for commercial and industrial clients. We have the necessary skills, knowledge and equipment to carry out testing and inspection of all existing wiring at your premises in accordance with the 17th Edition of the IEE Wiring Regulations, BS7671. We can provide a Periodic Inspection Report and carry out a full assessment of your existing electrical installation. We will also advise you on any work that maybe required to bring it in line with regulations.